Born in Vietnam, Men Nguyen has always done things his way. In 1978, he left his harsh surroundings by boat and made his way to the United States, settling in Los Angeles. He didn’t speak any English at the time so he took three English classes a day until he could speak well enough to get himself a job delivering furniture for $10 a day. As he continued to study English, he worked his way up to become a furniture machinist, where he made furniture for the better part of eight years. He has always had a strong work ethic and has applied that to his poker trade as well. He says that everything he has learned about the game is by watching others. He started playing poker, in 1985, when he took a short trip to Vegas with a friend. He saw a 7 Card Stud game which he recognized from his home land, so he sat down not realizing that in the U.S. they use a 52 card deck as apposed to the 28 card deck (eights through aces) that he was used to in Vietnam. His first experience was not the greatest. He lost almost everything he took with him, but he didn’t let that get him down. Instead, he walked away, studied the game for a week, and returned. When he did, he won everything back…and more. 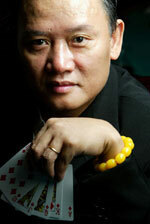 Men Nguyen continued to play poker and with his winnings he started his own furniture store and dry cleaners. In 1990, he sold both businesses and started playing poker professionally. At the tables, he has a reputation of being polite and courteous but at the same time a very fierce competitor. He wants every opponent to play their best against him saying “The last thing I want is for someone to try to be my friend by not playing hard against me." Men Nguyen has won the Card Player Magazine ‘Player of the Year’ award four times and is regarded by many as one of the top cash game and tournament players in the world. He has racked an amazing 7 WSOP gold bracelets and shows no signs of letting up. He has a live tournament winnings total of more than $10.5 million and counting! A very consistent winner, Men Nguyen coaches Vietnamese students in his game—earning him the nickname “The Master.” He has been a poker mentor for his cousins David "The Dragon" Pham and Minh Nguyen. He also is a practicing Buddhist. He is very involved in the Vietnamese community both within the U.S. and in his home land donating portions of winnings for schools, orphanages and various other causes. He says he never reads poker books, but plays with a strategy that’s all his own. And by his results, it seems, it must be working. In 2010, won the WSOP 7-Card Stud this being his 7th gold bracelet! In 2006, he took 4th in the WSOP 2-7 No-Limit Draw Lowball event. In 2006, he made final table and places 6th in the WPT World Championship. In 2003, won the WSOP 7-Card Stud this being his 6th gold bracelet! In 2003, won the WSOP Ace-to-Five Triple Draw Lowball. In 1996, Men placed fourth in the WSOP Main Event. In 1996, won WSOP Omaha 8 or Better. In 1995, won WSOP Limit Omaha. In 1995, won WSOP 7 Cards Stud Split. In 1992, won WSOP 7 Card Stud his first gold bracelet. Men donates part of his winnings to build orphanages and schools in Vietnam.